February 2004. Brad got to wear the "halter monitor" for a 24 hour BP reading again. It was much better this time, for one thing, we were at home so he had his own room and I got some sleep. lol. Also it was set differently and did not go off as often overnight so Brad got to sleep as well. Finally some good news for Brad!!!! Brad was selected to go to Disneyland with 27 other kids with life threatning illnesses, by Koru Care, NZ. On the 27th of March 2004, he set off in his adventure, going to Disneyland, Knotts Berry farm, California Park, Universal studios, Chips Hwy patrol, San Diago Zoo and much more. Two weeks of non stop fun. He had a ball!!! 20/09/04 New Zealand has one of the top Paediatric Heart surgeons in the world. Kirsten Funicane will be operating on Brad within the next month, all going well. Kirsten is going to reconstruct Brads aorta. Richard and I are obviously concerned about this procedure but have faith in Kirsten and believe that Brad will be in good hands. Brad is now 12 and a half and is looking forward to being able to "keep up with the other kids" once he has recovered from this surgery. We will be glad to get it out of the way before the end of the year so we can enjoy Christmas and Brad can start College next year in good health. Thank goodness for modern technology and new techniques. In the couple of years since our devastating news, a new technique had been invented to reconstruct an aorta like Brads. Our wonderful surgeon was to use this technique on Brad where his aorta is split long ways and an artificial half of an aorta would be made from gortex and sewn on side by side to make a wider “tube” as his new aorta. Pretty major and lots of stuff I really didn’t want to think about. 01/10/04 Auckland Hospital have called and Brad is to be admitted on Sunday 11 am for surgery Monday afternoon 4th October. I don't know if it's better or worse, knowing what we are about to go through again. Either way, once again the tears have started. Richard is in Sweden on a business trip and is trying to get home in time. I will be updating this page as soon as possible after the surgery. 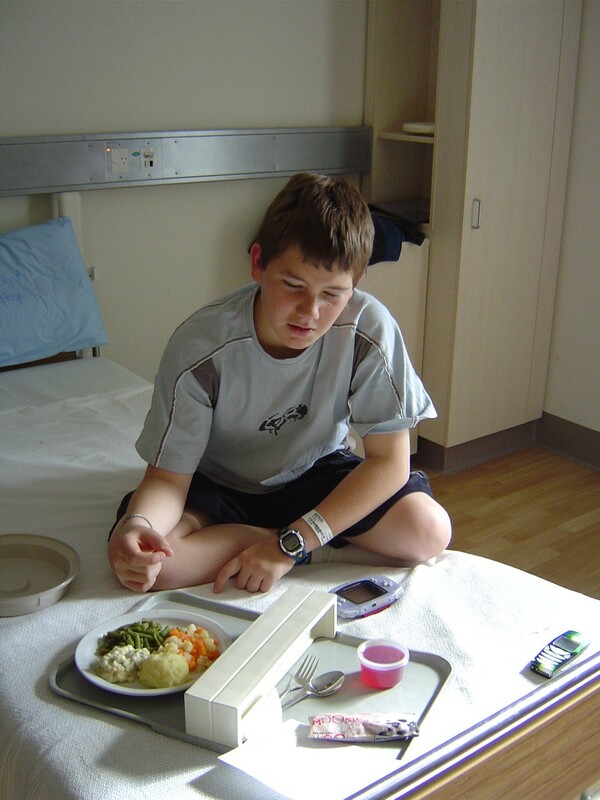 3/10/04 Brad, Chloe and I arrived at hospital at 11am. Brad was weighed, temp, height and Blood pressure taken, blood oxygen levels checked. X-ray done. Brad & Chloe were in good spirits, telling me not to worry. Richard was in mid air somewhere. Chloe went to spend the night at some wonderful friends, Pat and Kerrye. Hospital food is STILL boiled into some sort of tasteless delicacy. The night before the operation.